Even better. I favour this choux recipe over the last not only because it’s savoury, it’s also much easier. 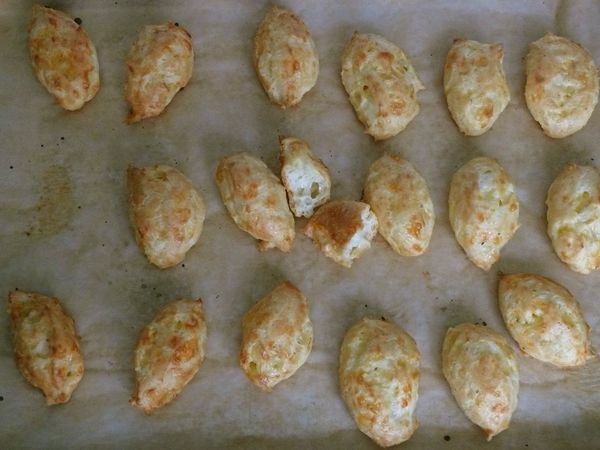 I found the batter a little looser, therefore a little easier to whip with all my might, the cheese gets mixed right in so nothing further needs to be done with them after they puff up, and you’re allowed to spoon them onto the baking sheet–no tricky piping. Put the butter in a heavy saucepan with the water, salt, pepper, and paprika. Bring to a boil and pull from the heat. Dump the flour in all at once, and beat until smooth with a wooden spoon. The mixture will pull away from the sides of the pan and form a ball. Put the pan back on low heat and beat for a minute to dry the paste somewhat. Remove from the heat and let cool about 3 minutes. Add the eggs one at a time, beating vigorously with a wooden spoon after each addition. You want a smooth, soft, glossy paste that falls easily from the spoon. Stir in the cheese. Using a pastry bag, pipe 1-inch/2.5 cm balls onto a buttered or parchment paper-lined baking sheet, or simply drop the mixture by spoonfuls. Brush with milk so they will emerge golden and shiny. Bake until puffed up, nicely browned, and feather light when you pick one up, 25 to 35 minutes. If you have any comments or tips on choux pastry, please leave them on the original LS baking academy post where all the learning happens. Thanks!